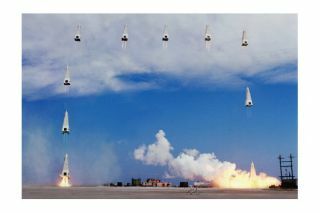 This photo montage shows how NASA's DC-X reusable rocket prototype launched and landed vertically during trials in 1993. When future visitors climb up the steep driveway to the New Mexico Space History Museum in Alamogordo, they can expect to be greeted by a four-story-tall cone-shaped rocket against the backdrop of the Sacramento Mountains. A new exhibit dedicated to the Delta Clipper Experimental rocket, or DC-X for short, is being prepared for display here, and museum officials say they are hoping to build a replica of the pioneering reusable prototype over the next year. Though the prototype was never intended to go to space — in fact, it was never in the air for longer than three minutes — the DC-X project demonstrated that a spacecraft could potentially be used to launch routine payloads into low-Earth orbit without being carried there by an expendable rocket. DC-XA toppled over and exploded during its last flight due to a landing-gear failure. Too much of the rocket was destroyed to attempt to reconstruct it. But some of its guts have been salvaged, including one of its original RL10 engines as well as its thrust structure, which was on display here, stripped of its shell with part of the liquid hydrogen fuel tank still attached. Those pieces are now housed in the New Mexico Space History Museum's Daisy Track Building. Additional, bigger parts at an offsite facility will eventually be displayed outside, said Chris Orwoll, executive director of the museum. Orwoll told the group here that all of the indoor galleries in the museum's main building will be renovated over the next several years. When that facelift is finished, some of the DC-X components will be placed inside — in both the third floor's display of engines, rockets and missiles and the second floor's human spaceflight gallery. Even though the DC-X prototype never carried people to orbit, Orwoll said he sees the vehicle as a "stepping stone" to many of today's spacefaring craft, especially commercial ones. Orwoll estimated that the replica would cost $25,000 to $75,000, adding that the museum is currently raising funds to build it over the next year. The museum is also home to the International Space Hall of Fame, to which the DC-X team members were inducted on Aug. 17. The honor marks the first time an entire group of people has been added to those ranks.